Now that the searing summer heat has left Fort Worth for good – and about time too – my garden is slowly recovering. It was definitely a season of hanging on to what can survive. Many things that usually bloom in summer failed altogether this year. 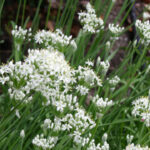 One herb that is blooming late is my garlic chives. I usually see the white umbels popping up in early August but not this year. Instead, they waited a month and have just now made their appearance. Garlic chives are the big brother of the more popular onion chives. The leaves grow to about 18 inches, twice as tall as onion chives. They have a similar umbel flower but it too is twice as big and is white, as you can see from the photo. The stem on the flower stalk is stiff. Leave the stalks to dry and you’ll have lovely light brown dried flowers with jet black seeds. I sometimes gather a cluster of these and put them in an earthenware crock for decoration. You can harvest garlic chives as soon as you begin to see new growth in the spring. Clip a portion of the leaves to within 2-3 inches of the soil (yes, that low). Each time you clip during the growing season, cut a different section of the clump to give it time to recover. Always use garlic chives fresh for the best flavor. Sprinkle diced garlic chives on soups or salads for a light touch of garlic flavor. Add some garlic chives to scrambled eggs or omelets. You can also mix them into your favorite casserole. Their subtle flavor and green confetti look will make any dish more appealing. The only problem with growing garlic chives is their ability to self-sow. Every spring I have an abundance of seedlings within a three foot radius of the main clump. Fortunately they can be pulled up with ease. Other than that, they are an easy care hardy herb.